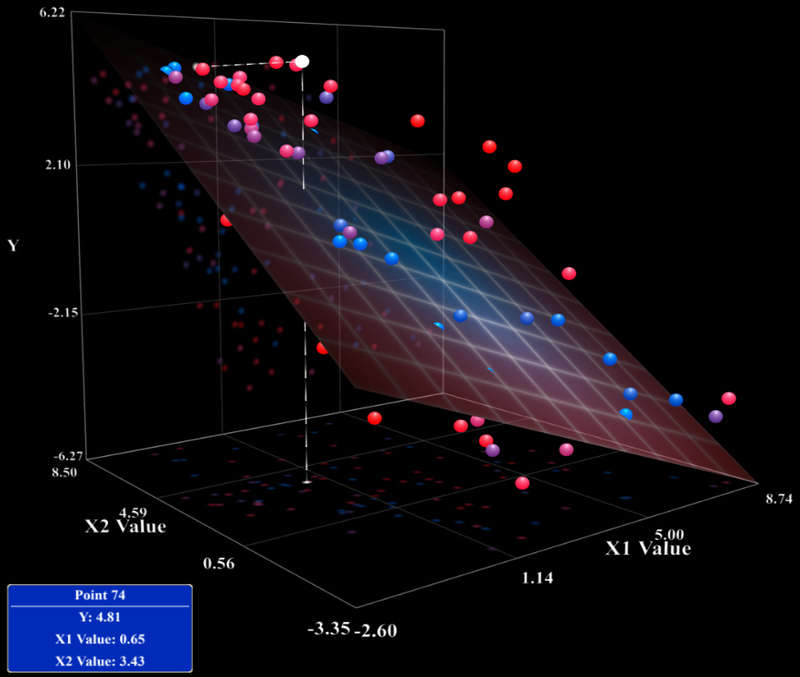 This page uses a dynamic three-dimensional scene to help visualize the effect of two explanatory variables. Click and drag the mouse to rotate the scene. Select a point by hovering your mouse cursor over it. Scroll the mouse wheel to zoom. Click and drag the mouse while pressing the SHIFT key to change the size of the regression plane. Click once to start and stop the automatic rotation. The regression includes an intercept term by default. Selecting this option sets the intercept to zero. The first row contains the graph title. Column labels are on the second row, followed by between 20 and 100 observations. Each data point has a label, followed by values for y, x1, and x2. Commas separate the values, and each row ends with a semicolon.